As previously described my PhD-project is aimed at improving Blended Learning within Higher and Further Education through remediation and redidactization. 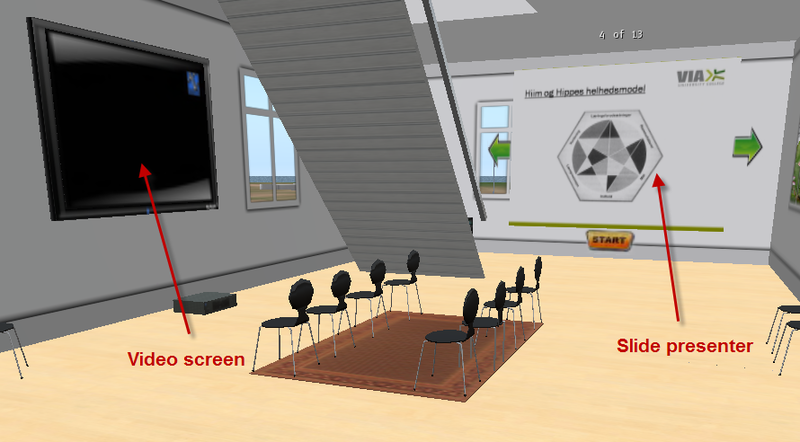 Through a process of designing and redesigning two specific Blended Learning courses within 6 research cycles the aspiration is to enhance learner experience and learning outcome by using new augmented/immersive 3D media and a learner centered Problem Based pedagogical approach. In both cases the target group is adult teachers/ trainers from the educational and the private/industrial sector from different countries. 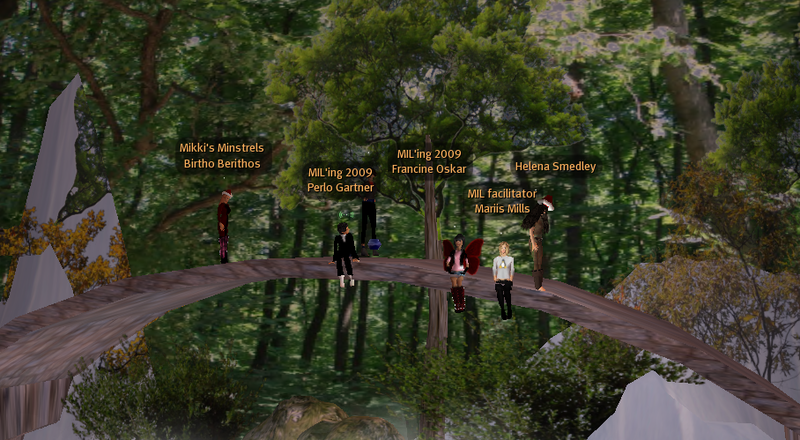 Having teachers/trainers as target group has made it quite natural to situate my work within the field of Didactics. Especially in Northern Europe Didactics refers to a field of research and practice concerned with reflections and actions related to teaching and learning. Historically the field has been teacher-, goal- and/or content-centered, but since the mid 1970’ies we have – at least in Scandinavia – seen an almost paradigmatic shift to a more learning and learner-centered approach. In Denmark this shift was above all initiated by the establishment of two new universities, in 1972 Roskilde and in 1974 Aalborg (where I work) that were founded in clear opposition to the “Old(fashioned)” universities by using an overall pedagogical approach based on Problem Based Learning and Project Organization in an attempt to amplify student motivation, engagement and learning with higher relevance for the surrounding society. Within teacher/trainer education Didactic Analysis, as a means to learn how to plan, act, observe and reflect on didactic practices, has been a core component of the curriculum, and especially one model for didactic analysis has gained widespread use, namely the so called “Didactical Relationship Model” by Norwegian education researchers, Hilde Hiim and Else Hippe. 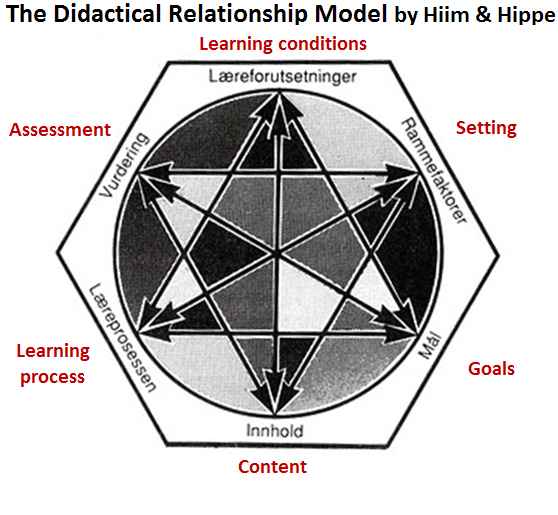 Building on the work of fellow countrymen, Bjørndal and Lieberg (whose original model was more teacher-centered), Hiim and Hippe developed the model to show some important relations between different elements in Didactics using a learning theoretical approach. 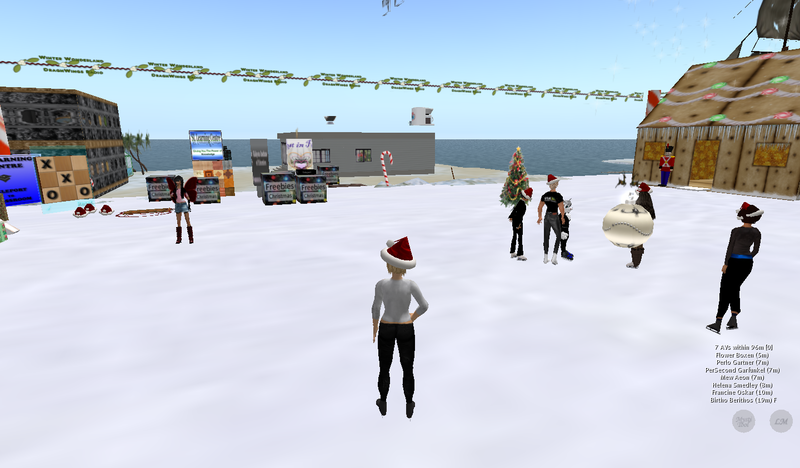 An English description of the model and the use of it in developing an online tutorial for Information Literacy can be found here. In my PhD-project I currently have data from 4 completed research cycles and I’ve decided to use modified versions of the Hiim & Hippe model as part of my analytical strategy, which will consist of several phases progressing from a general to a more specific focus on didactic elements I find relevant in my particular case. Throughout the different phases I will be using different models, but as I find Hiim & Hippe’s model useful in depicting important relations and elements for general analysis, I’ll start by presenting this model briefly. As mentioned above the model shows 6 important elements in a teaching/learning situation, these elements are interrelated and so influence each other in various ways and to various degrees. Even though I find the concept of depicting interrelated elements valuable, I don’t agree on the chosen elements, the description/content of the elements and the semantics in general. In my dissertation I will of course elaborate on this, but for now I will turn to my own revised models. In line with Hiim & Hippe’s model, my model also portrays important didactic elements, but I have chosen to add a few more elements, substitute one and rename some of them. I also prefer to speak of connections instead of relations, while the latter to me implies some sort of personalized bond that I don’t see between all the elements that are interconnected. I suspect that the major reason as to why Hiim & Hippe’s model has gained such popularity has to do with the fact that the elements are quite generic and thus enable the user of the model to define sub-elements depending on own needs and purpose. One could argue that the elements I’ve added already are part of Hiim & Hippe’s model as sub-elements, but by highlighting them I believe greater emphasis can be obtained. While I do consider the elements in my model to be generic too and that my work with the model will refine the content/sub-elements, I do have some preliminary reflections. ICT – in Hiim & Hippe’s model part of the setting. 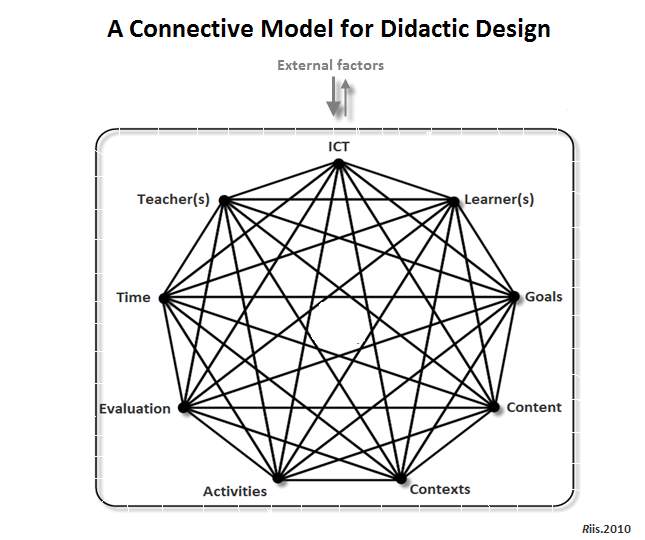 In my point of view the use of ICT has the potential of changing the Didactic Design quite dramatically and should as such not just be a sub-element. Furthermore the use of ICT has been written into the curricular of most educational practices from pre-schools to HE in Denmark. Teacher(s) & Learner(s) – in Hiim & Hippe’s model people are absent at first glance. The Teacher is considered to be part of the setting and I guess that since the model is aimed at describing learning conditions and learning processes the student is somehow inherent. Based on my own teaching experience I, however consider the people involved in the Didactic Design to be the most influential element. This does not mean that I don’t consider the conditions (e.g. prerequisites) for teaching and learning to be important. On the contrary, but I think there is an acute need to focus on teachers’ conditions separately – especially when we combine Didactics with ICT. Goals – in formal education goals are dominated by curriculum, but depending on theoretical foundation they can be formulated and attained more or less teacher-driven. One of the major advantages of a Problem Based approach is exactly the possibility of sharing the responsibility for this element between all participants in the Didactic Design. Content – another element typically determined by curriculum and goals, but again within a Problem Based and especially Project Oriented approach this element can be based on collective decisions. Contexts – teaching and learning doesn’t happen in a vacuum. Didactic Design is always situated, but not restricted to physical buildings or formal settings. Activities – another very important element that shapes the teaching and learning processes possible and therefore also potential outcome. Evaluation – Hiim & Hippe use the word assessment, which I think mainly relates to the learners and I do believe that a critical review on the teacher(s) and the teaching also is an important part of sustaining quality and I think that evaluation better covers this. Time – is a crucial element, but is often missing in models and theories of teaching and learning despite the fact that there seems to be consensus on the fact that learning at a certain level actually takes a lot of time. 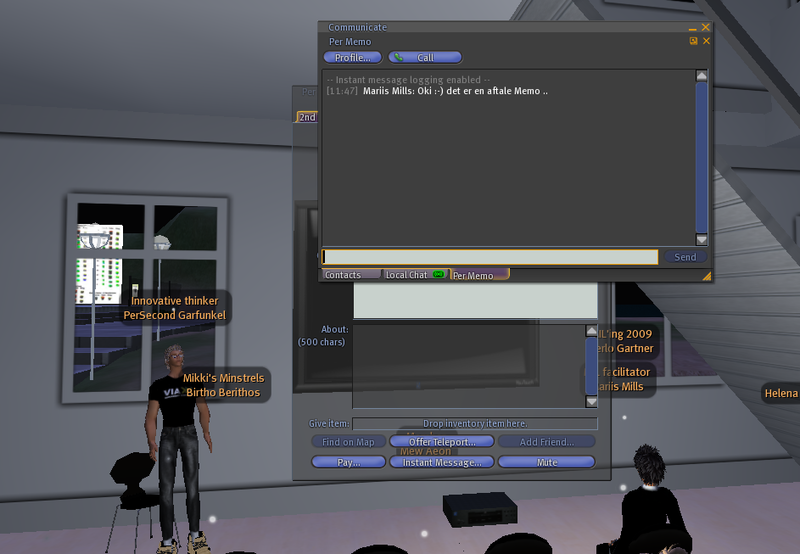 Besides the time available for learners another sub-element could be time available for the teacher(s). In my experience many teachers/trainers find especially ICT-integration difficult and frustrating precisely because they don’t feel that they have sufficient time to learn to master the technologies and subsequent practices. Besides revising the number and to some extend the content of the elements, I’ve also chosen to place the elements within a frame illustrating the point that Didactic Designs within formal education generally function as quite closed systems with very little permeability. Usually the influence from external factors (e.g. political, economical and other societal factors) is much greater than the other way. It may come as a surprise that the model doesn’t appear that different, but that’s actually an important point of mine. ICT-remediation constitutes a potential for change, but it doesn’t happen automatically, and changes will depend on the various types of ICT. 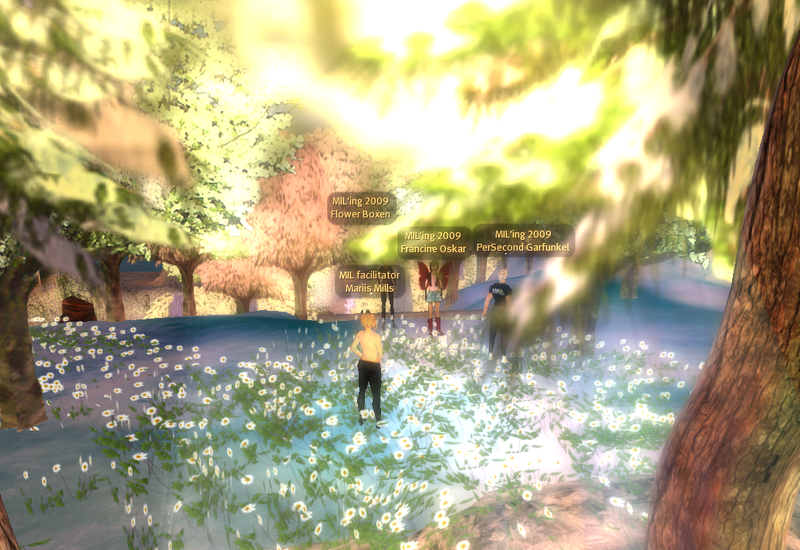 Walled Garden technology – like conventional LMS’/VLEs – is never pedagogical neutral. Different types of technology have different kinds of affordances and the user’s possibility to change or modify intrinsic ways of communication and content creation is usually very limited. As long as the majority of formal educational institutions choose to rely on conventional technology for remediating their practices, I personally see little prospect of real change. There are, nonetheless, some positive aspects in all of this. 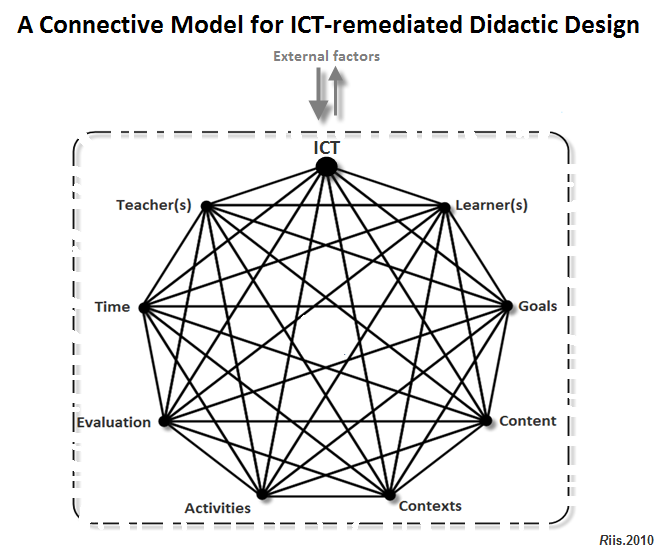 Regardless of the rest of the elements in the model ICT-remediation – especially based on Web 2.0 – will force the system to open up and connect more with the outside world and as both learners and teachers become more ICT literate as a consequence of ICT permeating our daily practices, I do expect changes to occur. It is quite deliberate that I’ve maintained the ICT element in this version of the model, because the use of SL doesn’t diminish the need to consider ICT in general. 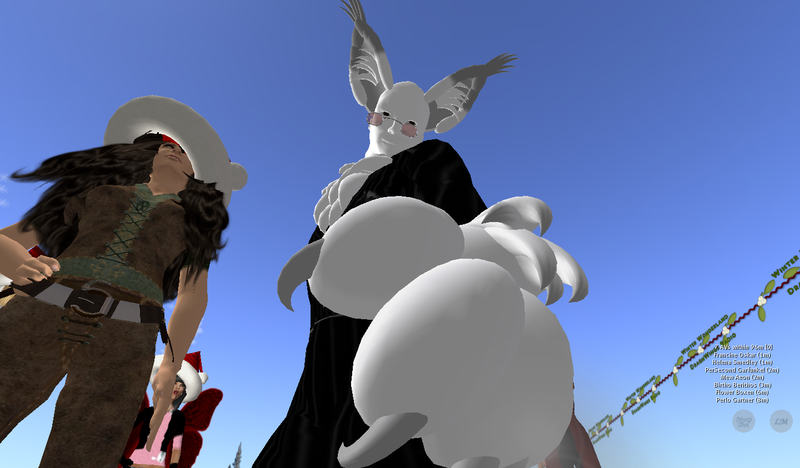 Several kinds of 2D technologies are at play in-world, and as I still consider SL to be an emerging, and sometimes very unstable technology, I wouldn’t at this point in time recommend using SL as a stand-alone technology. These models all focus on traditional didactic elements and I will use them (most likely in revised versions) for my general Didactic Analysis. 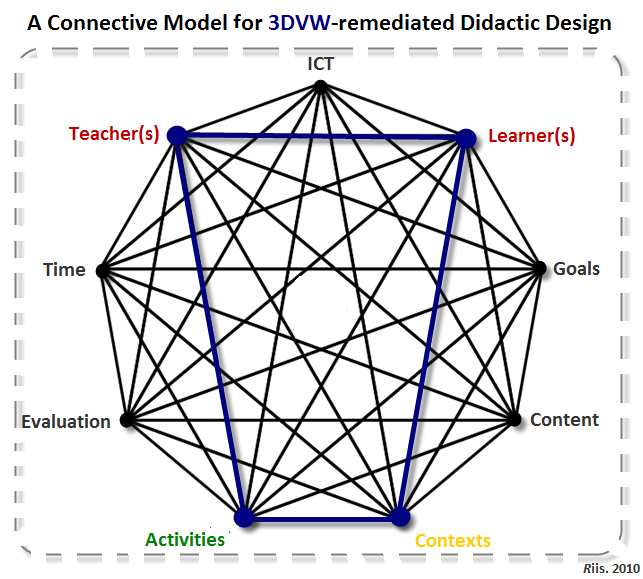 The last version has a clear connection to another model I’ve developed, which focuses on People (teachers/learners), Places (contexts) and Practices (activities). Based on that PPP-model I’ll be able to focus on topics that are less common in Didactics and in this way I think the models will complement each other profitably.